The pulp era's most lethal crime-buster wages his deadly war on crime in two violent thrillers by Norvell Page. The White House itself hangs in the balance as Richard Wentworth attempts to prevent a power-mad dictator from turning our nation into an "Empire of Doom." 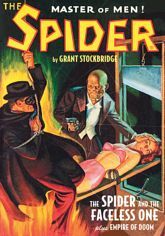 Then, the city burns as The Spider seeks to unmask the mysterious Munro, a murderous master of disguise who could be anyone in "The Spider and the Faceless One." This double novel pulp reprint showcases the original color covers by John Newton Howitt and Rafael De Soto, John Fleming Gould's classic interior illustrations, and historical commentary by Will Murray.